Kaohsiung city mayor Chen Chu (with sunglasses) waves to supporters of DPP presidential candidate Tsai Ing-Wen during a campaign event. 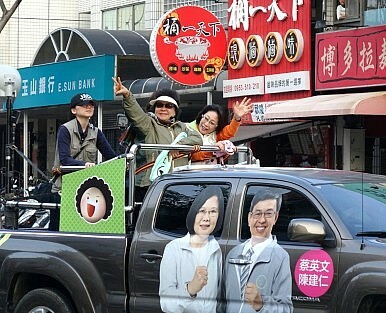 Taiwan heads to the polls on Saturday. Here’s a rundown of who’s running, what’s at stake, and the latest predictions. The polls for Taiwan’s presidential and legislative elections will open at 8 am on January 16, bringing months of speculation about the potential results – and their ramifications for East Asia geopolitics – to an end. According to Taiwan’s Central Election Commission, polls will be open from 8 – 4 for Taiwan’s 18.78 million eligible voters. The race that has attracted the most attention is the contest for Taiwan’s presidency. Polls have consistently shown the candidate for the opposition Democratic Progressive Party, Tsai Ing-wen, with a large lead over the ruling Kuomintang’s Eric Chu. The final opinion poll before a mandated blackout on the public release of such data had Tsai with 45.2 percent support, with Chu at a mere 16.3 percent (22.4 percent remained undecided). Complicating things is the presence of third-party candidate James Soong of the People First Party. Soong, whose PFP is considered part of the KMT’s pan-blue coalition, has polled not too far behind Chu for much of the race, leading to hand-wringing in the KMT that a split vote between their candidate and Soong could cost them the election. It wouldn’t be the first time; Soong’s independent bid for the presidency in 2000 allowed the DPP ticket of Chen Shui-bian and Annette Lu to eke out a victory with only 39 percent of the vote (Soong received 36.8 percent, with KMT candidate Vincent Siew at 23 percent – combined, their voters would have easily defeated Chen). Aware of that risk, Chu made an impassioned speech at his final campaign rally on Friday, urging all pan-blue voters to support him. “Over the past 20 years, whenever we were divided and not united, we failed,” Chu said. Meanwhile, Soong vowed that if elected he will form a true coalition government – and said that the DPP and KMT shouldn’t be allowed to monopolize public discourse in Taiwan. Tsai, meanwhile, remained confident that Taiwan’s voters are ready for a change. “Over the past four years, I’ve traveled around Taiwan, I’ve seen the suffering of the people and I’ve heard the public’s call for change,” she said in a Friday evening rally in New Taipei. “The third rotation of power should further deepen democracy in Taiwan, fuel economic development and, most importantly, allow people to regain trust in politics.” The first power transition in Taiwan since 1949 came in 2000, when the DPP’s Chen Shui-bian assumed the presidency; power changed hands again in 2008 with current president Ma Ying-jeou’s election. Tsai is hoping to take Taiwan’s top office back for her party, after running unsuccessfully against Ma in 2012. However, the presidency isn’t the only thing up for grabs; Taiwan’s 113 legislative seats are as well. Of those seats, 79 will be directly elected while 34 are at-large seats that will be filled by voting for different political parties. All told, there are 556 candidates from 18 political parties competing for representation in Taiwan’s Legislative Yuan (LY). Besides the DPP, KMT, and PFP, the New Power Party (one of several new political parties formed in the wake of the Sunflower Movement) bears watching – as Linda van der Horst recently noted for The Diplomat, the NPP is now polling as Taiwan’s third largest party. Given the mass of candidates (and the lack of detailed surveys on legislative races), the eventual balance of power in the legislature is harder to predict, but the DPP is hopeful that it can win a majority of the LY for the first time in history. Most experts are tentatively predicting DPP control of Taiwan’s parliament. Almost no one is saying the KMT will win its outright majority back, although it’s entirely possible that the KMT will remain close enough to be able to form a coalition government with other pan-blue parties (like the PFP). Taiwan’s elections are attracting widespread attention, in part because Tsai seems such a lock to win. Beijing has never been comfortable with the DPP, which (unlike the KMT) does not owe its heritage to mainland China. Meanwhile, though Tsai has been insistent that she will preserve the “status quo” of cross-strait relations and preserve the gains made under Ma’s tenure, she has also pointedly avoided endorsing the so-called “1992 consensus.” That agreement between the Chinese Communist Party and the KMT holds that there is “one China”, though each side claims to be the legitimate representative of that China. In the lead up to the election, Beijing has repeatedly tried to pressure Tsai into accepting the formula, saying it is the only possible foundation from cross-strait relations. But how China will actually respond to a Taiwanese president who neither affirms nor denies the principle is anyone’s guess (though Richard Bush of the Brookings Institution took a stab at predicting it in a recent interview with The Diplomat).